All you think is how hard it is during this time of year… in our data teams work, with our immense daily workload, with benchmarks, state testing and ACT prep pending, and our district walkthrough ahead of us. But as crazy as it sounds, these issues are not bigger than you – not to the professional that you are. Not to us, the trained educational experts. The difficult tasks and times are not your equal. Take those claims out of your mind and out of your mouth. You just need to change your point of view. Put the situations into perspective. Remind yourself, the work just isn’t bigger than we are. We should not be looking up at any of it like it is bigger than us – we should be looking down at the issue as one that we can and always do manage — and manage well. Think about David and Goliath – the giant [problem] may have been bigger than David, but the situation wasn’t. He had faith. We need to have faith. And we need to be in this together. Remember, a stick alone is easily broken. 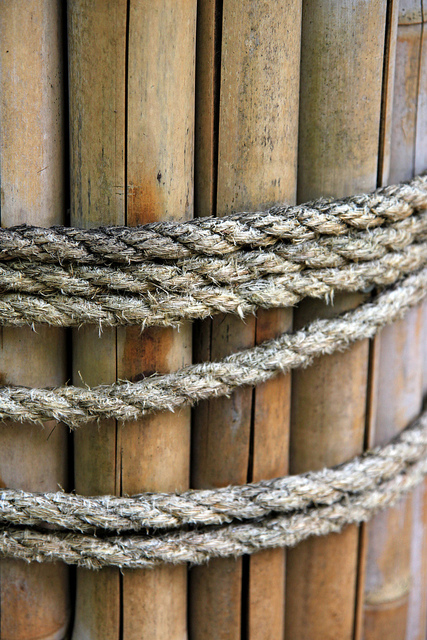 But many sticks bundled together are impossible to break. Do not stand alone in your efforts in our journey toward excellence. Our challenges are not meant to be faced solo. We need to stand strongly, arm in arm, from the inside to the edges. And as we change our perspective, remember our challenges do not have to be stumbling blocks; we should see them as stepping stones raising us to a new level in our journey. We just have to have the courage to make the climb. And understand that as we look for areas to improve, one new realization of an area for us to improve is just that – one realization. It is not a set back in our journey nor is the improvement insurmountable. Joined together, no matter the uniqueness in our stances, no one can break our excellence. Monday is the STUCO Blood Drive. Tuesday is the SR Class Officer Meeting during CAMP. Wednesday we have a SIP meeting at 3:00 in Room 106. Thursday is JEPD in the library. Friday we will have our intruder drill practice. A few items to prepare for: don’t’ forget to bring your laptops and formative assessments to JEPD on Thursday; we will have CAMP Congress also Thursday in the auditorium. I will send out a worksheet for your representatives to collect information from your CAMPs for the meeting. As we work on writing our SIP for 2012-2013, we will be collecting information from many sources. Make sure your voice is heard by sending your information to your department chair or just drop by and let us know ideas you have for our action steps. It’s always nice to have good directions while you are on a journey. I was reminded last week that perfection is overrated. I agree, and at Benton we have never been about perfection. Those who think we are must be walking a very lonely path. I think we are about teamwork, and that work is hard work. As we begin our work to plan for next year’s improvement steps, we find ourselves in the midst of completing the cycle of improvement we are currently working toward. It causes us all angst. It challenges us. It causes us to question our progress, workload, and future. Do not give in to the need for perfection. We all agreed way back in the dog days of summer that we were on a journey… a journey toward excellence. We knew our data teams work would be rigorous. It proved true. We are not perfect at it, but you have to KNOW that your learning was solid. That learning will pay off. Finish strong and do your best to complete the work we have committed to this year. At this point in your data teams work, you should be solidly embracing the idea of your last few power standards. What is your data telling you? Are you able to identify students’ strengths and weaknesses? Are your identified instructional strategies for the differentiated groups working? These are the questions, plus many more, that we should be talking about during collaboration. As we look toward the next year’s plan, do not be intimidated by the fact that we will all engage in the data teams process. What data will you consider to select your power standards next year? Did what you used this year give you the information you needed? Will you adjust your current standards or stay the course? What professional learning do you want in order to better facilitate our data teams process. Please do not hesitate to make recommendations for our PD for next year. And remember…we will do our best. Perfection was never our intention. So, it’s a good thing we are not working toward perfection. Tomorrow is Friday and this information is only being shared today. It’s been a great, short week. I hope you had a great PD day and were able to learn what strong instructional leaders you are. I think we can easily identify areas for our improvement – please voice your ideas with your department chairs. It’s important to work on what we need most. And that, my friends, is how we improve. When thinking about the exciting Court Warming week we enjoyed last week at Benton, I must tell you that I absolutely love our school, our students and our teachers. I love that we are in love with getting better at what we do each day. Please forgive me this cliché, but we never said it [our journey to excellence] would be easy, but we did say it would be worth it. Thank you to everyone who made last week excellent and worth it. STUCO, counselors, ACT Academy instructors, cheerleaders, nutrition, maintenance, staff (especially for your participation all week), and students – you were all amazing. Despite the social events we enjoyed all week that make high school in America the experience it is, I was also humbled and pleased to visit classroom after classroom where the teaching and learning was exciting and new. Every day I am delighted to see our students learning in ways that even in our cart/computer environment I did not see in such a saturated fashion. 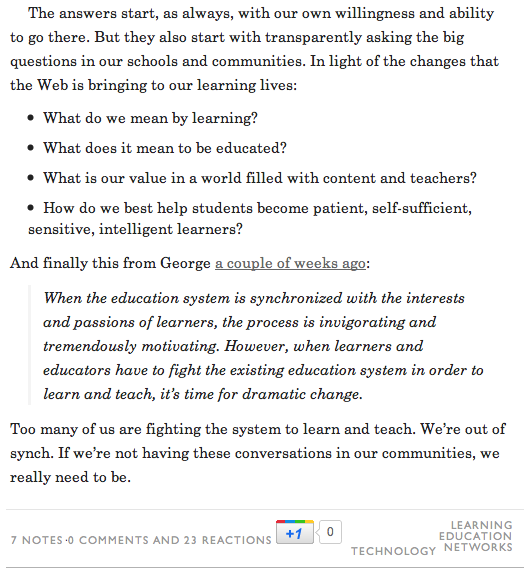 Then on Friday, I was guided to a post written by Will Richardson that I think absolutely grounds us in the thinking we must have resonating through our instructional staff. Will is a dear friend of the St. Joseph School District, and so by default, Benton family. If you do not follow him on Twitter (@willrich45), you should. 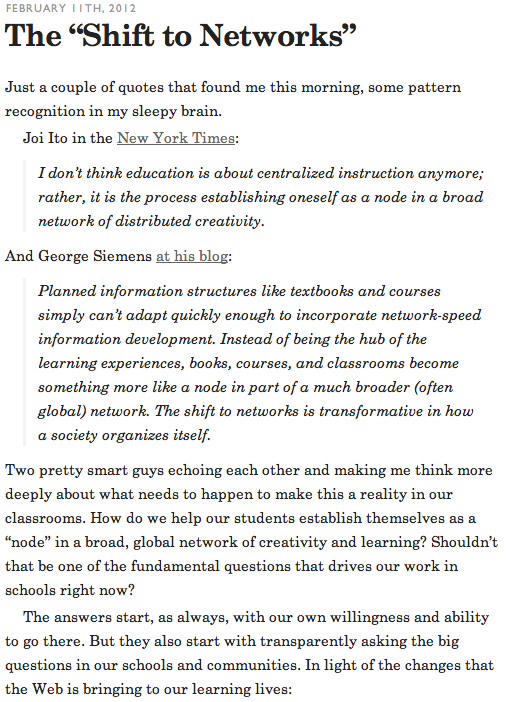 I am linking his blog here for everyone to connect with his learning on-line, and finally, I am pasting this post for you all to think about. I hope more than anything, you fall in love with his excellence. Thanks Will for keeping us all focused on our journey to excellence. Are you thinking snow? You are in good company. We are ready if the Monday snow dance does actually work this time. Just a reminder, this week we have department meetings on Tuesday and Wednesday to finalize the preparing for student registration for 2012-2013 and ensure everyone feels very comfortable with the process. Our counselors will meet with you in small groups (department chairs should contact Karen if you do not know time/location to meet with the counselors) to answer any specific questions and help you with any concerns you may still have at this time. They have worked hard to prepare us and our students – they are meeting with students by grade level to give them information that will continue to make the process as smooth as possible – and I know this will be one our most successful registrations ever. Tuesday and Thursday we have our senior nights for boys and girls basketball, respectively. Tuesday we are celebrating with RED OUT dress up, and Thursday is Retro dress up. Join the fun and let’s live it up with our students! It would be very touching if you could be there for our athletes. Speaking of touching, this is “Have a Heart” Week. Symbolically, the color of the week is red. It’s our color, and our week to revel in the moment. Take time this week to say something special to a student and faculty friend. Be a listener. Share smiles and kind comments. This is our week. One group of students you could especially “share the love with” is our wrestlers who will leave Wednesday to head to Columbia for State Wrestling. We are super proud of how they have represented us all season, and it would be fitting to show them how much you care. Finally, Friday is faculty lunch. What a nice way to end this fun week of caring. Make sure you participate and come socialize with each other. And thank you all for making it worth it. I love coming home. I especially love it when I have visited other schools and come home the dedicated, incredible, crazy (I say that totally in terms of fun) people I work with every day at Benton. After attending EduCon 2.4 and visiting the Science Leadership Academy (SLA) in Philadelphia, PA, it hit home how much we have really focused on becoming the school we envisioned five years ago. Without question, SLA is an amazing school, and the work they are doing there allows students to really grow and learn. In an era when what is expected from educators and educational institutions has changed dramatically in as little as a decade, Benton has also taken great strides to keep up with the changes and in many facets of our thinking, we might just be leading the way. I truly believe reaching the point where we operate today has come some deep reflections in our own practice, being and staying prepared to meet the challenges of the next days, months and years, and then most of all pulling together in the same direction to offer the most productive environment and opportunity for learning that we cohesively are capable of offering. It has not been an easy journey. We have come from the days where we were focused on reducing tardies (Do any of you remember that? We had over 32,000 tardies that year that with a focused plan we reduced to just under 7,000), to looking at a plan next year where we are focused on implementing data teams throughout every course we teach so that our transparency of practice – from selecting power standards, to very detailed data analysis, ending with specific differentiation our classrooms – allows our students to be more capable of achieving their goals than ever before with all of us accountable to our students and each other. It’s a lofty goal. It’s a goal that takes a dedicated, incredibly, and somewhat crazy staff to achieve. Yes, I’m talking about you. This week is not only Homecoming Week, but it’s also National Counseling Week. Celebrate with our candidates and our counseling staff. Please take time to say something special to each of them. You never know how much it means to have support from a co-worker and teacher. Make a difference in another’s life this week. Monday we have a Pep Assembly (pep assembly schedule) for Mr. BHS (2:10; 2:00 dismissal for participants; list will be sent by sponsors). I can’t wait to see the line of candidates. Make sure you cheer loudly for our teacher nominee! And please announce to your students that there will be free game entry both Monday and Tuesday for any students wearing the NEW Cardinal Crazies shirts (for sale in the school store). For students who have purchased an activities pass, they will get a ticket from the gate worker for a free hotdog/popcorn at the game. On Tuesday, Benton will participate in the National Earthquake Drill that will take place at 10:15 a.m. Please make sure you review your emergency flip chart. We will also be on assembly schedule with the Pep Assembly for Staff v. Students Bball game (2:10; 2:00 dismissal for participants; list will be sent by sponsors). Thanks to everyone who will be participating on these special days. Our kids really love it when we join them and play. On Wednesday, we have JEPD all day to prepare for registration (schedule will be sent Tuesday) as well as the first SIP planning meeting for 2012-2013 plan at 3:00 Room 108. On Thursday we have the ACT Academy final session before test as well as the PTA Founders Day Dinner that night to celebrate our PTA members (you don’t have to attend, but feel free to thank our PTA parents for their service if you happen to see them out and about). On Friday we will be on Pep Assembly schedule once again for Homecoming Court with an earlier class release for the event. (1:40 dismissal – 1:30 for participants – list will be sent by sponsors). I understand we are going to have a great staff dance team performing during the assembly. Between finding out who is on Homecoming Court and watching the staff dancers, I can’t wait until Friday! Also Friday night is our big game and Homecoming King/Queen crowning and court presentation. I would hope this would be a BIG STAFF ATTENDANCE night. We will definitely have reserved seating that night for our staff. 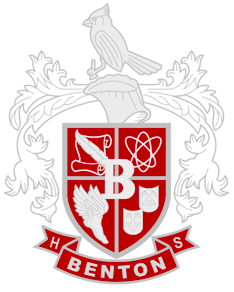 Finally on Saturday Benton will host the February ACT testing and then later that night we will have our Homecoming Dance (7-930 – sophomore class sponsors are assigned supervision and should arrive 15 minutes early). Like I said, it’s going to be a great week. Join in and enjoy the ride. You will not regret nor forget making memories. The kids won’t let you! All images are CC available in Flickr: “Red door” by Steve-h; “Heart” by seyed mostafa zamani; “Stairs” by swisscan; “Marinos Ices Mixture” by Stephen Zacharias.